When a family is faced with a dementia or Alzheimer’s diagnosis, the news can become overwhelming and cause frustration; that makes this is an important time to find flexibility and patience so that your loved one receives optimal compassionate care. 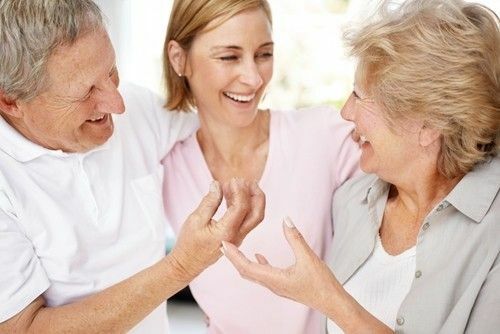 Because Alzheimer’s is a progressive disease that goes through several changes and individuals cope with these stages in different ways, there is not an across-the-board solution for those who are living with dementia. Yet there are certain aspects of your role as a caregiver that are needed to help your mother live a productive and happy life as she ages. One of the most devastating aspects of the disease are the changes to the brain that can affect your mother’s ability to communicate. To give her the compassionate care she needs, it is important that you are first able to understand each other. According to the Alzheimer’s Association, there will only be a few minor changes in the way your mom communicates during the early stages. For instance, she may repeat certain stories, have her sentences trail off or not be able to find the correct phrasing or words. Find a place that’s quiet with limited distractions so she can focus. Let her know it’s OK if she faces challenges with communication – it’s always best to be patient, offer support and let her take her time to gather her thoughts. Stay away from correcting, criticizing or arguing. Listen to what she is trying to tell you and don’t escalate the conversation if you disagree, as this will make things worse. Find nonverbal ways to communicate, whether she points to what she wants or uses gestures to explain something. One of the best ways to keep dementia or Alzheimer’s challenges to a minimum is to limit and ease common frustrations in her day-to-day routine. A great way to get started is to set up a daily schedule that doesn’t go too far off-track. Make sure that meals are served during similar hours each day and that she wakes and goes to sleep around the same time as well. On days when doctor’s appointments or bathing is needed, try to schedule them during the times that your mom is in a calmer or more agreeable state of mind. Sometimes it can be very difficult to find the patience that comes with caring for a loved one with Alzheimer’s. However, it is very important that you give your mother the time she needs to complete tasks so that she still maintains a degree of independence. Let your mother take her time so that she can categorize certain processes on her own – although it’s tough, caregivers need to know that things are going to take longer than they used to after an Alzheimer’s diagnosis. You can reduce your mother’s frustrations by limiting her choices, according to the Mayo Clinic. For instance, if your mom is picking out what she wants to wear for the day, give her a choice between two outfits rather than choosing from an entire closet full of clothes. You can also make better use of time by providing simple instructions with clear steps and minimizing distractions such as the TV and radio when it’s time to focus. Handling a troublesome situation, such as your mother becoming upset or angry; it is best managed by redirection. Although you should try to talk through the conflict at first, your mother might be too upset to handle the conversation. In these times, it’s better for everyone to simply change the subject or environment and move on. To do so, have your mom talk about her childhood or other aspects of growing up. Many Alzheimer’s patients might not remember short-term details, such as what they ate for breakfast, but can recall events that happened decades ago. Encourage her to talk about memories from the distant past, as this can keep her senses sharp and allow her to keep good memories in the forefront of her mind. Compassion and patience are attributes that you must have as a caregiver if you want to create a healthy environment for your mother and limit your stress.